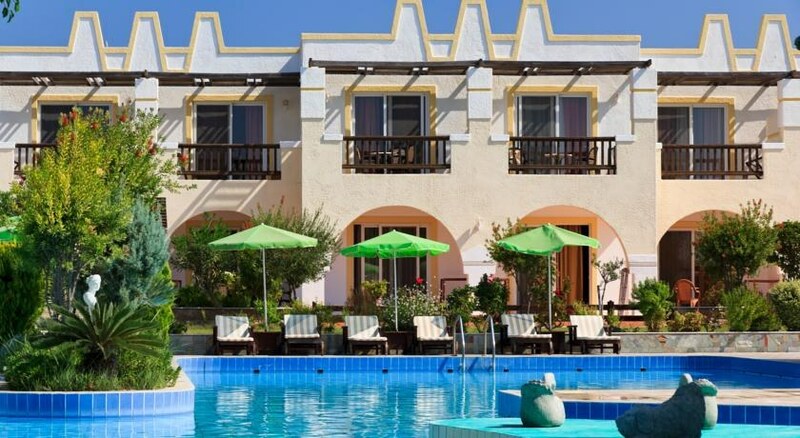 The 4-star Gaia Royal Hotel is an ideal hotel for those looking for a sunshine holiday filled with charm and lots of fun. The hotel is just a short walk from the beach where guests can enjoy this wonderful location while there’s plenty on offer at the hotel. Guests can enjoy a great dining experience, explore true style and comfort in their room and spend hours around the pools while the little ones enjoy the slides. The Gaia Royal Hotel is an ideal destination for those who are looking for a holiday in a prime location while offering everything they need for an action-packed holiday. The nearest beach is just 500m away where guests will find crystal-clear waters and loungers where they can spend the day lounging under clear blue skies. However, for those guests who like to explore there are plenty of historical sites while thrill seekers can head to one of the many water parks located nearby. There are bars and restaurants located within the vicinity as well as a lively atmosphere, enabling guests to immerse themselves in this brilliant location. The hotel is 11km from the airport. The Gaia Royal Hotel provides a wide choice of rooms including Double Standard, Double Superior, Family Rooms, Family Superior Rooms and Junior Suites. Each room is brightly decorated and offers plenty of space for guests to relax. All rooms offer a premium stay where guests can find a range of facilities including air conditioning, satellite TV, en-suite bathroom with a bathtub, fridge, Wi-Fi, safe and a balcony. The hotel offers guests a dining experience at the on-site restaurant where they can explore a choice if dishes throughout the day. There is also a bar where guests can enjoy a choice of beverages throughout the day while the pub has a lively and friendly atmosphere. For those who love their music and a good dance, there is a disco on-site that is open until the early hours. There’s something for everyone at this hotel with two pools for the adults and a separate pool for the little ones including water turrets and water slides. There is a kids’ club and a playground to keep them busy while the grown-ups can head to the spa where they can enjoy a range of treatments. Active guests can workout at the gym or enjoy activities including Tennis, Volleyball and mini golf. There is no shortage of entertainment either as there are themed nights, live music and dancing each evening. Could do with a lick of paint here and there and all inclusive does not include vodka!!!! But all in all a great holiday and lovely staff would go again any time.